A Children who is out of contact from his family from few weeks ago. 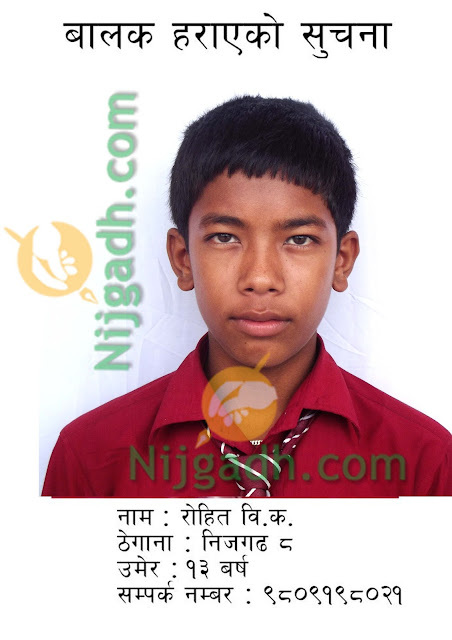 A Children of Nijgadh Named Rohit B.K who used to study in Class 4 of Gaurishankar High School of Nijgadh. Please Feel free to Share this post . Among the missing children, 167 were boys and 73 were girls. In the same way, the latest report dating from July 16 to September 16, 2016, showed that 38 boys and 22 girls were registered as lost in the Valley. Of these, 45 children were found while 15 are missing till date. “Our centre records data of missing children between the ages of 12 and 15. We have learned that most missing children ran away from their homes feeling neglected,” he said.